Impedance (Z) is the property of a circuit or cicuit element that opposes current. Resistance is impedance arising from the conversion of electrical energy to heat or radiation and consumes energy. Reactance is impedance arising from the storage of electrical energy in an electric or magnetic field and does not consume energy. Impedance, and both of its components are measured in Ohms (Ω) which sometimes leads to confusion. The most common misconception being that knowing a circuits resistance is all that's required to calculate how much current will flow. This is compounded by the generic use or R where Z is meant. To understand why this is so it is important to realise that Reactance is typically in the order of 100 times smaller than Resistance, in a perfect circuit Impedance = Resistance and there is zero Reactance. A perfect Voltage Source VTh is one whose output does not drop under load. In practise any source has an internal or Thevenin Resistance RTh called the Source Impedance. 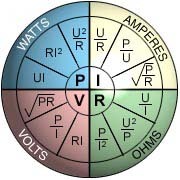 The perfect voltage source is equivalent to the no load or open circuit Voltage. To calculate Source Impedance connect a known resistor to the source and measure the current.